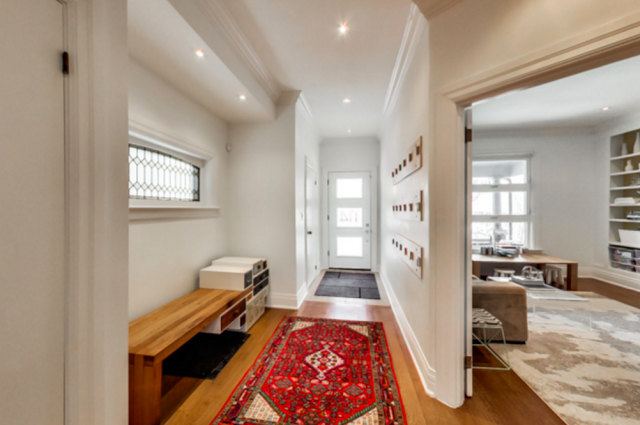 This is a 4+1 bedroom, 5 bathroom semi on a 25 x 135 foot lot with a detached 2 car garage at 114 Albany in the Annex. It's a fully renovated house with new floors, new bathrooms, a new kitchen, and new windows. And for the most part, I really like the renovation. I am just not crazy about that kitchen/dining room situation. I really wish there was an island there or something because it seems like a lot of open space that isn't necessary. I wonder how difficult it would be to get rid of that wall beside the sink and create an open wall into the family room with a counter that runs where the wall is to create an breakfast bar. The third floor is a big, bright space with a large walk-in closet and an office. And the basement is fully renovated with a good ceiling height. But other than the yard and the kitchen situation (which might not bother many people), overall, this is a great house and I love how they have furnished it. It is simple but fun. This house is listed at $1,850,000. At first, that might seem a little high. Then this place is probably selling over $2 million as well (if it hasn't already). I'm thinking somewhere closer to $2.1.